Pay careful attention to Jim Garrison’s comments starting at 4:14 in the video. At the time of the Jim Garrison trial, he made mention of a plan to assassinate Fidel Castro, which when President Kennedy refused to execute, he himself was killed. 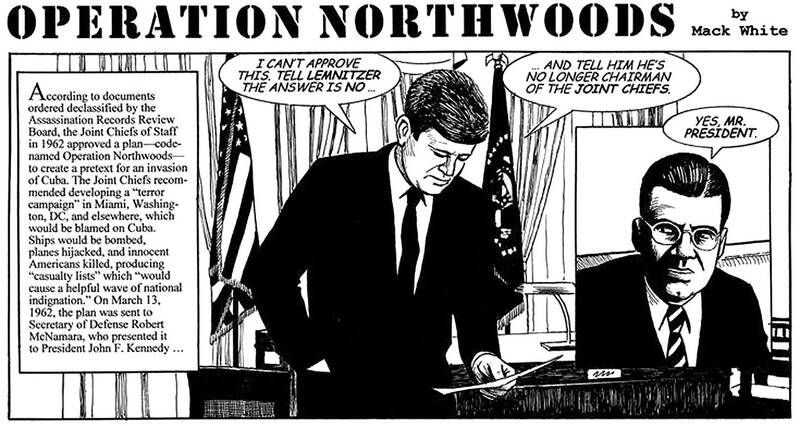 “Operation Northwoods was a series of false flag proposals that originated within the United States government in 1962, but were rejected by the Kennedy administration. The proposals called for the Central Intelligence Agency (CIA), or other operatives, to commit perceived acts of terrorism in U.S. cities and elsewhere. These acts of terrorism were to be blamed on Cuba in order to create public support for a war against that nation, which had recently become communist under Fidel Castro. If Operation Northwoods proposals included hijackings and bombings followed by the introduction of phony evidence that would implicate the Cuban government, why not the assassination of President Kennedy? Wouldn’t that provoke Americans into an all out war with Cuba? What is known is that Lee Harvey Oswald was employed with the FBI at the time of his death, and that he was warning the FBI that was a militant right-wing plan to kill the president. Audio clip: Miami police recorded an FBI informant who discussed the assassination with a ultra right-wing militant Klansman Joseph Milteer, November 9, 1963. On November 24, 1963, two days after the assassination, Milteer related that they would not have to worry about Lee Harvey Oswald getting caught because he “doesn’t know anything” and that the “right wing” is in the clear. As you can hear in the audio clip, Miami police recorded an FBI informant who discussed the assassination with a right-wing militant Klansman Joseph Milteer. On November 9, 1963, Milteer stated that President Kennedy would be assassinated in a few days, shot from an office building with a high powered rifle. When told there would be plenty of bodyguards, he said it would make it easier, and that was indeed the case. On November 24, 1963, two days after the assassination, Milteer related that they would not have to worry about Lee Harvey Oswald getting caught because he “doesn’t know anything” and that the “right wing” is in the clear. He also stated that that “The patriots have outsmarted the communists and had infiltrated the communist group in order that they (communists) could carry out the plan without the right wingers becoming involved.” At the time of the Jim Garrison trial of Clay Shaw, he described a plan to assassinate Fidel Castro after the failed invasion in the Bay of Pigs, which when President Kennedy refused to execute, he himself was killed. “President Kennedy was assassinated by men who sought to obtain a radical change in our foreign policy, particularly with regard to Cuba. You recall that under President Kennedy the Cold War began to thaw and there were new signs of an effort on the part of the Soviet Union and ourselves to understand each other. “On the map, this [Cuba] appears to be merely a large island off the coast of Florida. But for many men it meant a good deal more than this. In 1963 a great variety of interests existed, which not only desired an American supported invasion of Castro’s Cuba, but took it for granted that it was inevitable. “In the minds of many men, this island represented a tremendous emotional landmark, because they had steered their courses toward it for so long, and with such intensity. “In the fall of 1962 the Cuban Missile Crisis occurred. 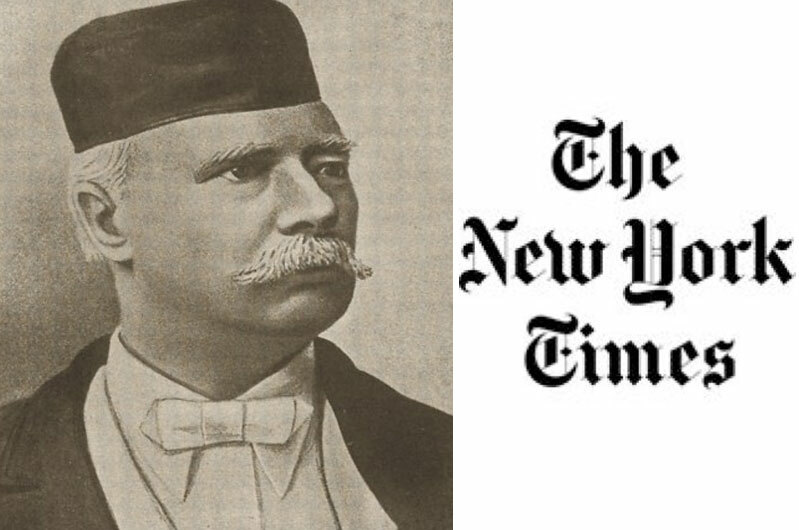 It was followed by a pronounced new attitude towards Cuba on the part of the United States. Cuba, after this was no longer regarded as an enemy and was no longer regarded as fair game for those men who for one reason or another focused their attention on this island. The new signs of understanding between Russia and the United States continued to develop. Why not just topple Kennedy through covert means that didn’t include murder? The whole point was to incite Americans to war with Cuba. The only way to pull this off is if you had a conspirator who would control the armed forces, FBI, CIA, and other federal agencies and news outlets once the assassination had been completed. There was only one person who could do that, and that was Vice-President Lyndon Baines Johnson. Johnson, at the time of Kennedy’s murder, was not to be on the ticket in ’64 and was also implicated in the murder of a federal agricultural agent in Texas, Henry Marshall. His Mafia ties had also become painfully apparent at a time when Robert F. Kennedy began to crack down on them. It’s also interesting to note that LBJ’s Secret Service codename was “Volunteer” at the time of the assassination. So why didn’t Johnson invade Cuba after there was such a preponderance of “evidence” implicating Castro? A pretty good reason: the KGB knew Johnson was responsible, and could prove it. Moreover, Americans, and the rest of the world, had been sobered up by the gravity of the Cuban Missile Crisis, which did indeed bring us to the brink of nuclear war.. A very close call with Soviet submarine B-59 demonstrates how close we were. On October 29, 1962, eleven US Navy destroyers and the aircraft carrier USS Randolf had been pursuing the submarine near Cuban waters, but unaware that the US had been dropping practice depth charges to force the submarine to come to the surface to be identified, the Soviet crew assumed they were being attacked. At the time the Soviet crew, having gone to deep in their effort to evade pursuers to monitor any civilian radio traffic from the Americans, had no idea if a war had broken out. There had also been no contact from Moscow for days. The captain of the ship wanted to launch a nuclear torpedo, but such a launch required the unanimous decision of three officers. Arkipov was one of them, and argued against the idea until he finally prevailed over the two officers in favor of a strike. Most Americans had no idea this had occurred, of course, but the incident did prove the asinine mindset of the war hawks who would later try to invade Cuba again, after Kennedy thawed relations with Cuba and the Soviet Union. 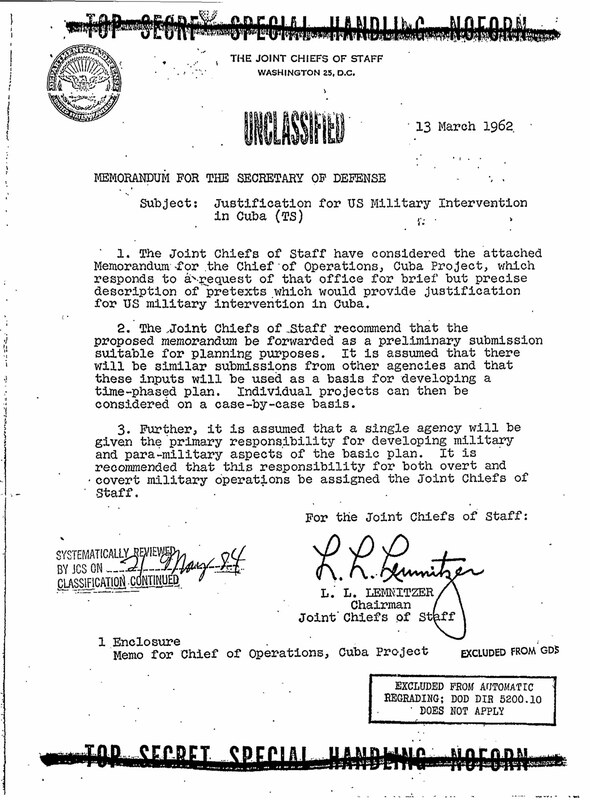 The Operation Northwoods memo below for the Secretary of Defense, Robert MacNamara, was written almost a year after the disastrous Bay of Pigs invasion. Hale Boggs, a member of the Warren Commission, came to believe that Johnson had a role in the assassination of JFK. Boggs had said, in regards to the “single bullet (i.e. Magic Bullet) theory that he “had strong doubts about it.” The implication, of course, is that Oswald couldn’t have acted alone. Ramsey gives him a name, but it is very difficult to discern due to the poor quality of the tape. 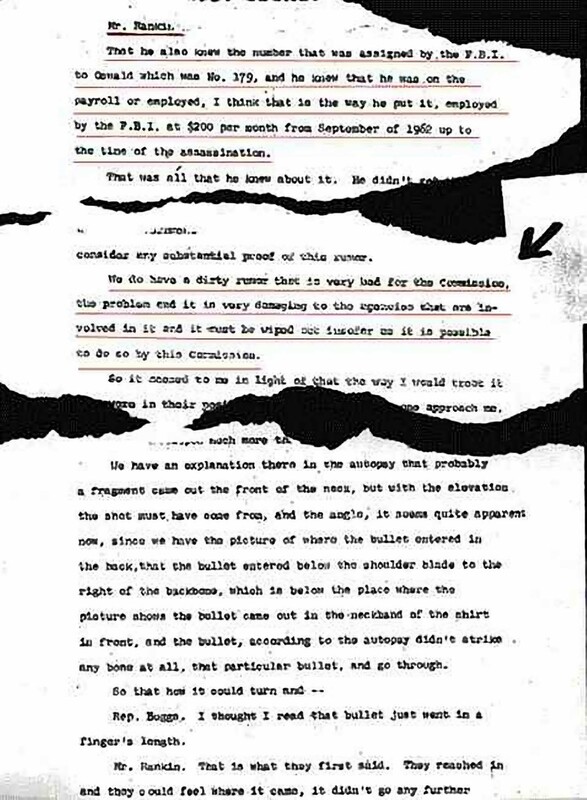 As was the case with the constant surveillance of Jim Garrison and any public figure who questioned the lone assassin theory or the integrity of the Magic Bullet Theory, he added that the “FBI had lots of eyes and ears with a fellow like Hale Boggs.” That the the FBI would be investigating a member of the Warren Commission which was tasked with discovering the truth about the assassination was telling in and of itself. Hale Boggs, incidentally, died in a plane crash under suspicious circumstances. In truth, the Kennedy assassination shouldn’t really be called a conspiracy, because it was much more than that. It was a coup d’état, or an overthrow, i.e. executed by a small group of the existent state, the military, which deposed the Kennedy administration to replace it with the Johnson administration. Because Kennedy would still have loyal supporters in the great majority of the armed services and intelligence community after his death, it was critical that the incoming president was allied with the conspirators to remove, disrupt, or mislead federal and state investigators. Johnson would now control the CIA, FBI, the remaining armed forces, etc. He would also have an incredible amount of control over the print and broadcast media, and it wouldn’t have been the first time. It’s been controlled to one extent or another since Word War II. If you want names, you’ll lose the forest for the trees. The coup could never have taken place without Johnson’s approval and participation. So where’s the evidence pointing to Johnson? What would motivate Johnson to participate in the plot? There were plenty of good reasons. He had mafia ties at a time when Attorney General Robert F. Kennedy was cracking down on them. He was implicated in the murder of Texas agricultural agent Henry Marshall. 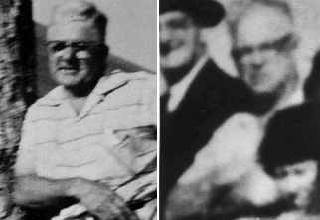 There was the Billy Sol Estes Affair. He was also to be dropped from the ticket in 1964, which would effectively end his presidential ambitions and leave him vulnerable to prosecution. Still from “Jim Garrison Response – Kennedy Assassination” after NBC did a hatchet job on his investigation. This trial gave us the Zapruder film, and forever ruined the credibility of the Warren Commission findings, even amongst some members themselves. Though he was certainly in the Fair Play for Cuba organization, Lee Harvey Oswald was indeed a patsy. Working for the FBI and on their payroll from September of 1962 to the time of the assassination, he was assigned the number 179 and making $200 a month. His time spent in the Soviet Union and his knowledge of the Russian language made him a perfect plant, and with his high clearance in the intelligence community, he was led to believe he’d infiltrate a Cuban plot to kill Kennedy. 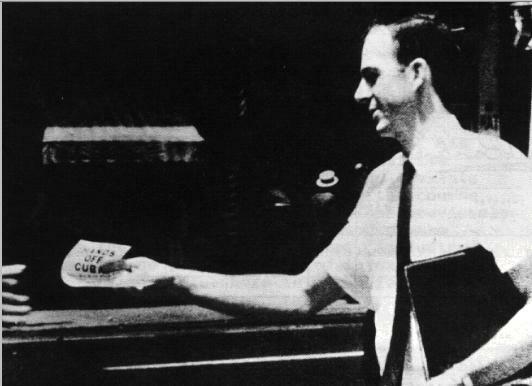 Here he is distributing Fair Play for Cuba leaflets. Letter to Warren report member J. Lee Rankin regarding Oswald’s FBI salary during the assassination period. Oswald’s handlers weren’t interested in stopping a Cuban attempt at a possible Kennedy assassination. They were looking to kill Kennedy themselves, and frame Oswald using his “pro-Castro” credentials to implicate the Cubans. Once done, they would have eliminated Kennedy (under the pretext that Castro did it), placed their conspirator and Vice-President Lyndon Baines Johnson in power, and provoked an American outrage that would finally force the invasion of Cuba. Until his last breath, when pressed, Johnson would insist that Castro killed Kennedy. This was the domestic terrorism, or false flag operation, that Operation Northwoods called for, and on November 22, 1963, in Dallas, Texas, it was actually carried out. Once received, the warnings would be dutifully scrapped by Hoover. On November 9, 1963, the same day of the FBI telex above, Milteer stated that President Kennedy would be assassinated in a few days, shot from an office building with a high powered rifle. 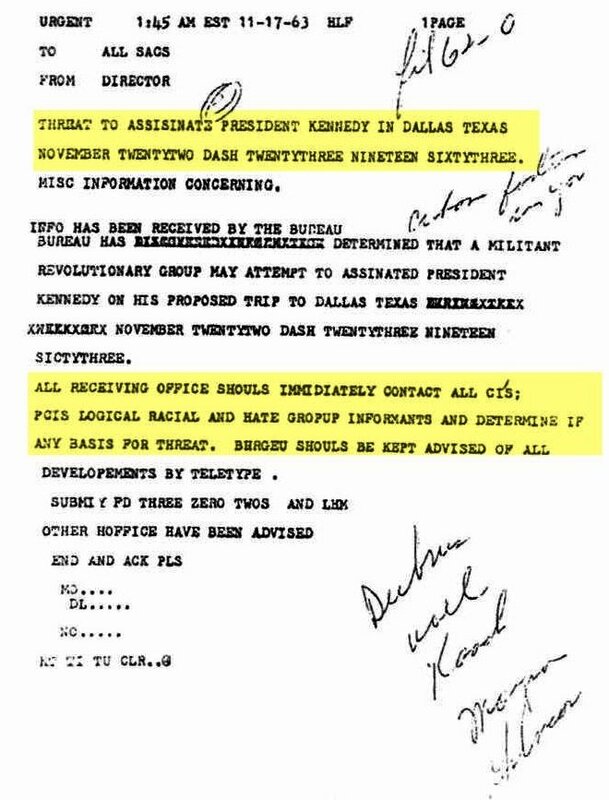 Note the reference to a planned assassination plot by a militant segregationist group [the Klan], which had led to the cancellation of Kennedy’s trip to Miami, Florida days earlier. On November 24, 1963, two days after the assassination, Milteer related that they would not have to worry about Lee Harvey Oswald getting caught because he “doesn’t know anything” and that the “right wing” is in the clear. He also stated that that “The patriots have outsmarted the communists and had infiltrated the communist group in order that they (communists) could carry out the plan without the right wingers becoming involved.” So why would hate groups, particularly Klansmen and other militant right-wingers care enough about Cuba to kill President Kennedy? That militant right-wingers were involved in the assassination is without question, because they drew up Operation Northwoods in the first place. At the time, the Klan had infiltrated offices as high as the Supreme Court, Senate, Congress, state and local law enforcement, etc. Supreme Court Chief Justice Earl Warren, who headed the Warren Commission, had himself been a Klan leader in Bakersfield, California. And of course, the Klan had also infiltrated the highest levels of the armed forces. On September 16, 1996, the Assassination Records Review Board released a hitherto heavily redacted FBI document indicating that the Soviets were in possession of evidence that Lyndon Johnson was responsible for the assassination of JFK. The invasion of Cuba never was carried out, of course, because the Soviets knew President Johnson was responsible. To expose him would mean certain doom for the conspirators, so they backed off of Cuba. 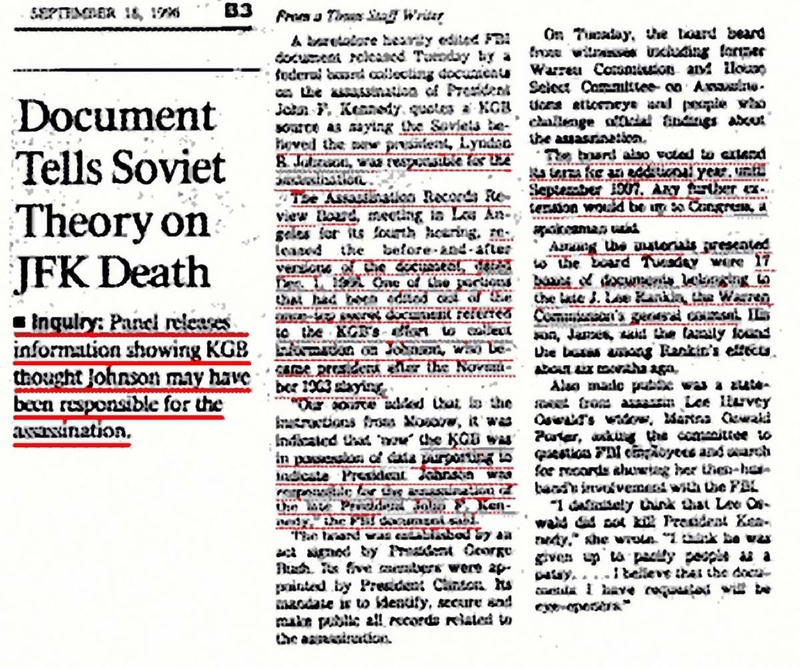 They could fool the public but not the KGB. 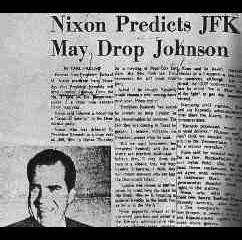 Afterwards, much of what was actually true was dismissed by CIA media media assets as Soviet propaganda designed to discredit President Johnson. If Garrison said that water was wet, they would argue that it wasn’t and televise “expert” witnesses who insisted it wasn’t. This was especially true during the Garrison trial of Clay Shaw, when the CIA was implicated in the assassination of President Kennedy. Because by extension this would include the complicity of Johnson (at least after the fact), an all-out effort was made to scuttle the case.